I’ve travelled around extensively in my research into Second life and have come across many glorious places to see. really nice calm place with some very nice buildings. Not roleplaying as far as I could figure out. People *rent* to use the buildings. the music and atmos created in this place is fab, real ireland – lots of rain driving wind and strong sea. Even loads of sheep… The buildings again are for rent I believe, quite nice and with open fires. This place has rock music, often pagan, and has a fair number of pagan/wiccan types with a number of witchy shops featuring witchy items for your avatar. This place is non role play (though looks like a good place for role play.) very chilled out ruins and interesting fire sprites and leaves blowing around. Well worth a visit this one, if you like jsut wonder around somewhere that someones taken time and effort with a good eye for detail to build. Barbies beech house is an adult place… if you get my drift, for fun loving adults. Though I have to say usually its a deserted beech. Beware though this is for over 18s. buddies bar has irish music, and is occasionally packed with dancing couples. Strange to go to a MORPG to listen to music and drinking beer… quite odd. as you can see a festive of the visual kind, expect to see unicorns, fairies and mermaids (though they won’t say much they aren’t players). Not roleplay, but does lend itself to that. 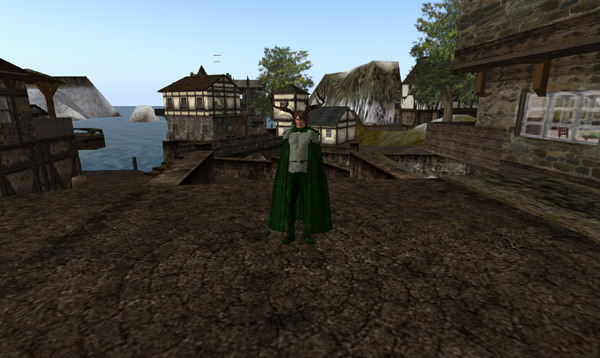 ravenscraig ( role playing medieval) Here is the first of many “role playing” SL locations. You need a hud (thats how you know your not dead hurt etc) – they vary but this ones pretty advanced I think. This one has medieval buildings and you are expected to converse with others as a medieval character. Another medieval role playing world. In mots of these places before you can get to the actual role playing theres a maze of shops to negotiate. Thats all for now – next update will be on shopping!